Quebec was colonized in the 17th century by France, a country that remained largely Catholic even as England, northern Germany, and other parts of Europe were turning Protestant. Like the mother-country, Quebec became Catholic. Protestants were not even allowed to settle there. Only after the British takeover of Canada in the mid-18th century was Protestantism even tolerated in Quebec. In much more recent times, Catholic Church membership and attendance have dropped off sharply in Quebec, and many congregations have had to close their doors. The availability of deconsecrated church buildings has given rise to some intriguing examples of adaptive reuse. On a recent visit to Quebec, I saw one church that had been converted into a restaurant and another that was a fitness center. Neither use really makes sense to me, because they do not take advantage of the single large, enclosed space that is a hallmark of churches. Decline in church membership is only one reason why churches might be converted to other uses or torn down. 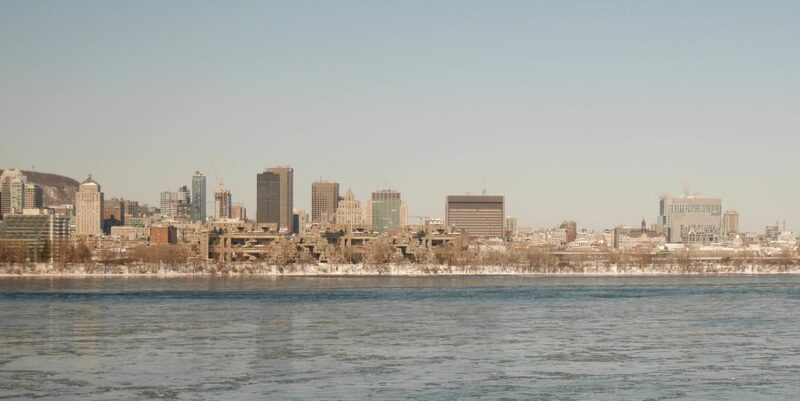 Another is urban redevelopment, which is carried out with particular ferocity on the land-hungry island of Montreal. Churches—along with many other buildings of historic value—disappear and are replaced by new construction. But they don’t all disappear without a trace. 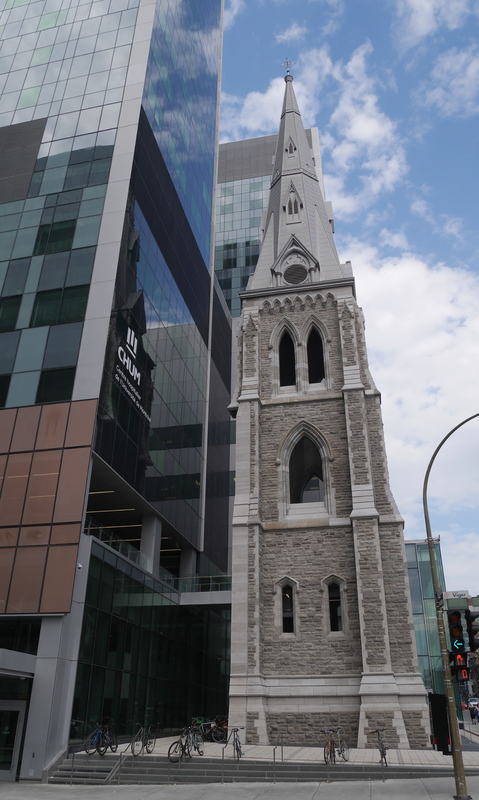 On the corner of Viger and St. Denis streets, there stands a lonely church tower without a church. This is the tower of Trinity Anglican Church, built in 1865 and demolished in 2011 to make room for a giant new hospital, University of Montreal Health Centre. The tower was rebuilt in 2016, using the original stones. Even as the city is redeveloped, this memento of the past has been retained. The reconstructed church tower of Trinity Anglican Church, next to University of Montreal Health Centre. The Gothic church tower reflected in the glassy facade of the hospital. 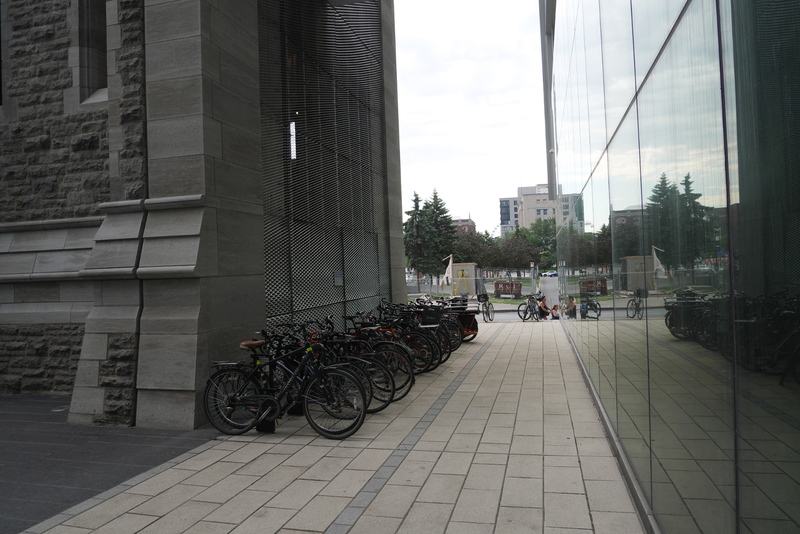 The backside of the tower is used for bicycle parking. The story of Trinity Anglican Church (in French) is inscribed in the reconstructed steps below the doorway. 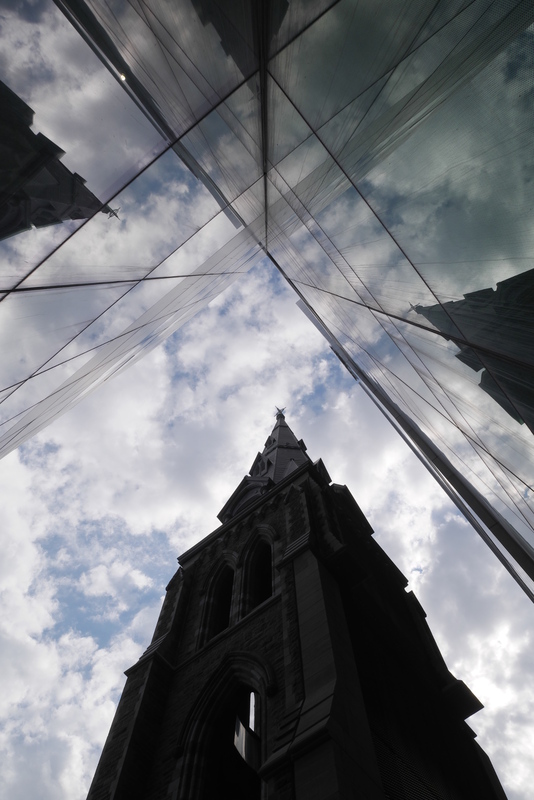 Vanishing Montreal blog has pictures of Trinity Anglican Church shortly before and during its demolition. In my first quarter teaching at Pacific Union College in Napa County, California, I got assigned an upper-division class about medieval Europe. PUC is close to a wide range of educational resources, as it is located within striking distance of San Francisco, Sacramento, the Pacific Coast, and the Sierra Nevadas. Had I been teaching California history, I might have considered taking my class to Mission Dolores in San Francisco, or perhaps the barracks at Sonoma. But when I was planning my class about the Middle Ages, it never crossed my mind that there might in fact be resources related to medieval Europe in the area as well. 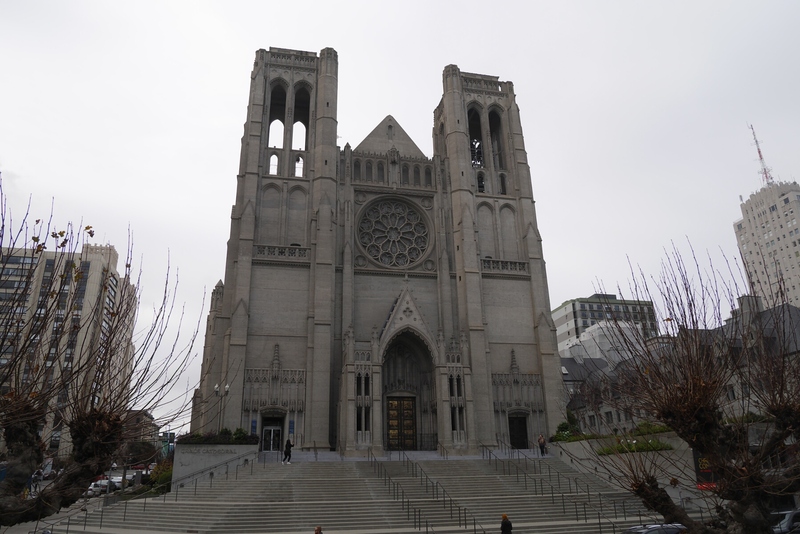 Then, once the quarter was well underway, I discovered that San Francisco has its very own (neo-) Gothic cathedral, standing atop Nob Hill and looking at least a little like the great churches built in England, France, Germany, and elsewhere in Europe during the High Middle Ages. All of a sudden, it occurred to me that there might be other relics of the Middle Ages in San Francisco as well—whether authentic or, like this cathedral, mere imitations. It was much too late in the quarter to incorporate San Francisco into my curriculum, and at any rate, I didn’t have time to catch my breath while teaching three classes for the first time. But after the quarter finished, I set off to investigate whether San Francisco—a North American city founded in the eighteenth century—could teach me something about medieval Europe. 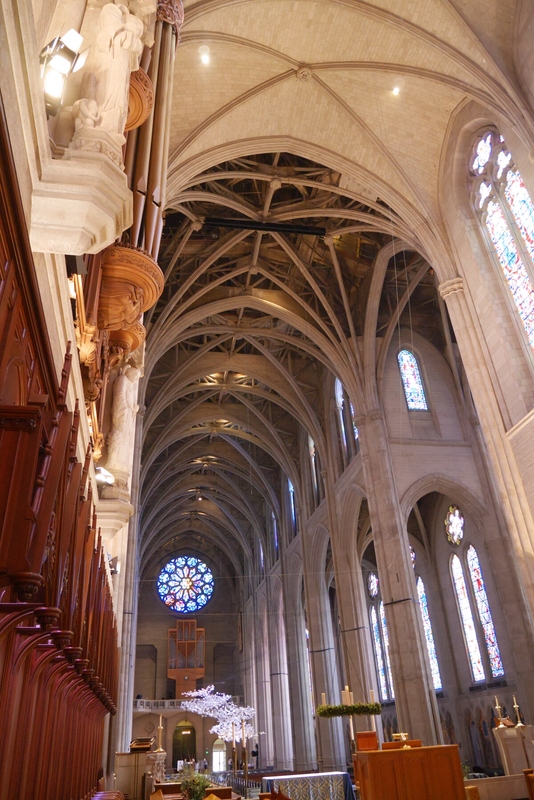 The first stop on my medieval San Francisco tour was Grace Cathedral, the church on Nob Hill. 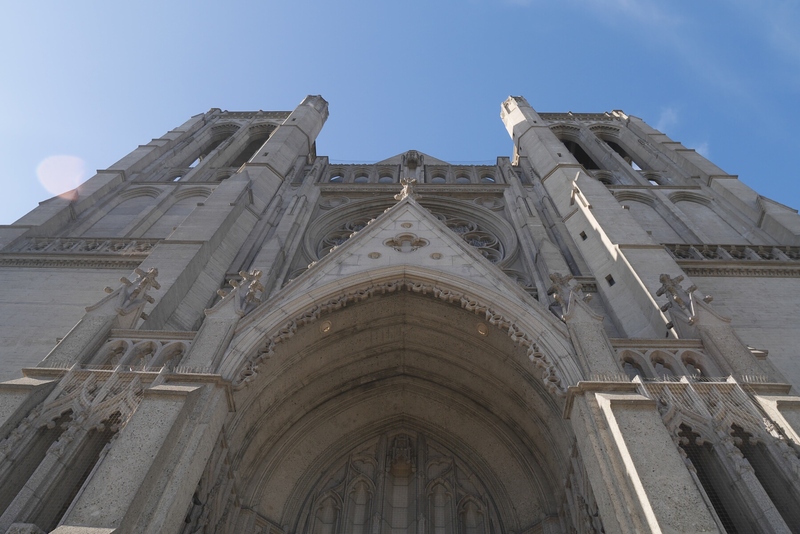 Built in stages from 1927 to 1964, Grace Cathedral has a structure of steel and concrete that is designed to be earthquake-safe. 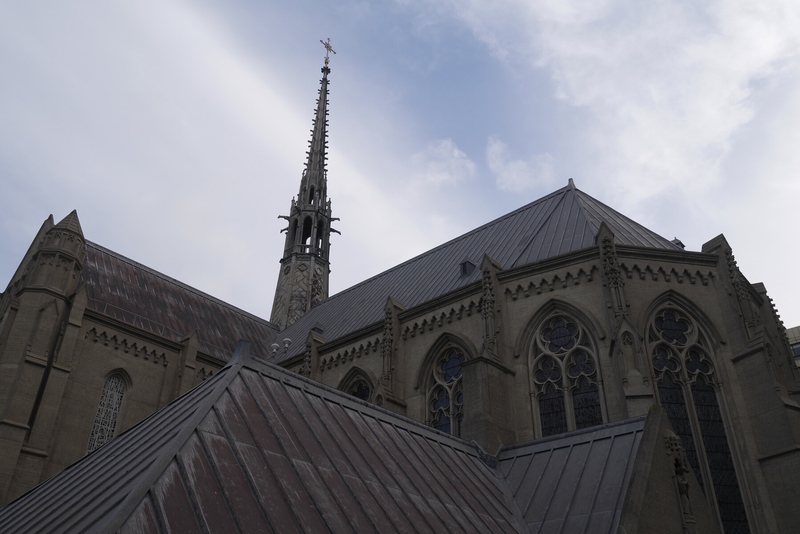 The architecture is primarily based on French Gothic examples, although certain elements were taken from Spanish and English churches. Looking up at the facade of Grace Cathedral. 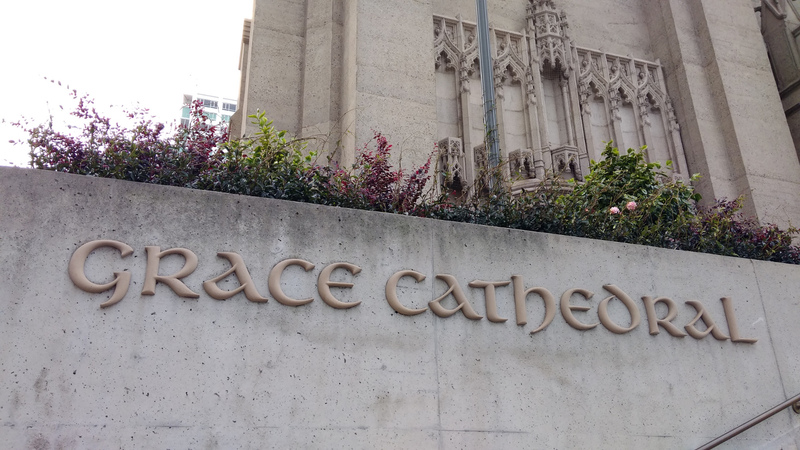 Almost all signage at the cathedral is written in this quasi-medieval uncial script. Although work on the church stopped in 1964, it has never really been finished—in much the same way that many medieval cathedrals were left incomplete. The vaults of the nave have not been filled in, and many of the wall and column surfaces are bare concrete. The parts of the church that have been completed look terrific; the rest, less so. View from the completed choir back into the nave with its incomplete vaults. 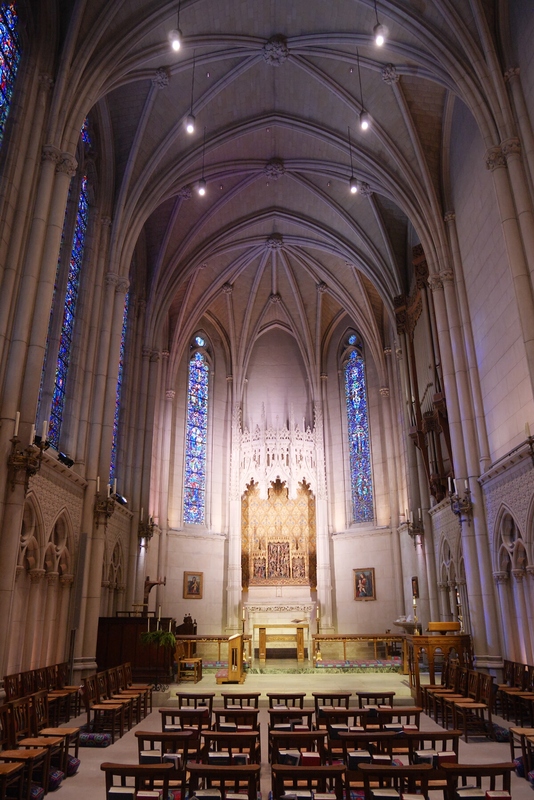 The apse of Grace Cathedral. I’m not sure why that little bit of vault at the very top of the picture has been filled in while the rest has been left open. The most impressive part of the cathedral for me was the Chapel of Grace, which has been completed in its entirety. It has an early-modern altarpiece. Chapel of Grace (completed 1930). 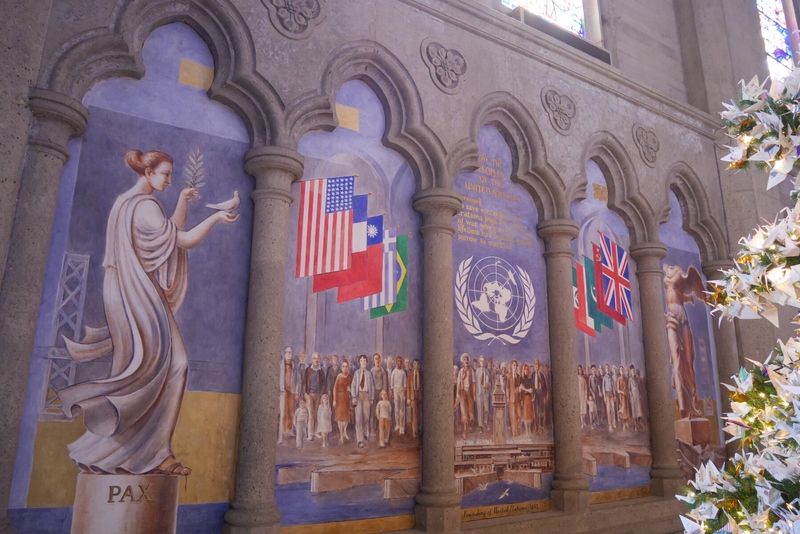 Along the walls in the aisles are murals illustrating a variety of scenes, including the construction of the cathedral and the founding of the United Nations in San Francisco in 1945. 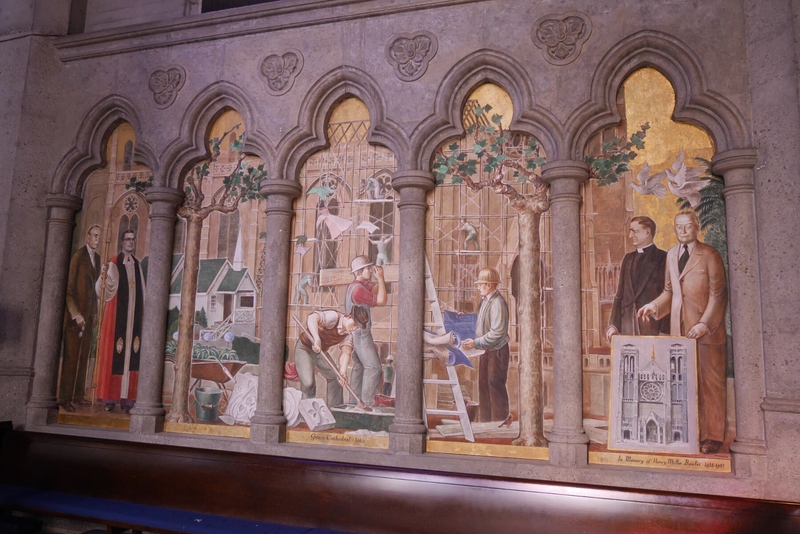 Mural of the construction of the cathedral. Mural of the founding of the UN (difficult to photograph because a Christmas tree was in the way). 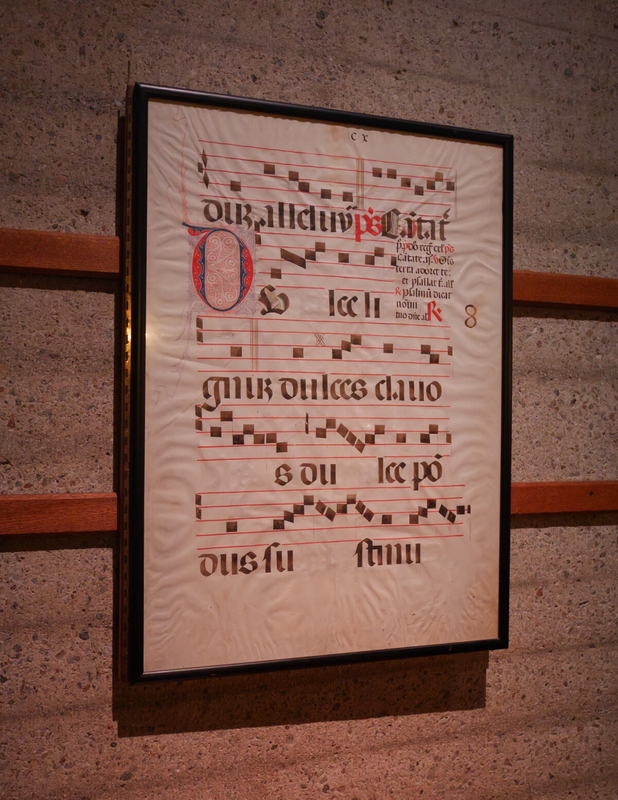 The cathedral is full of art, ranging from an actual medieval Spanish crucifix to a triptych completed in 1990 by Keith Haring. 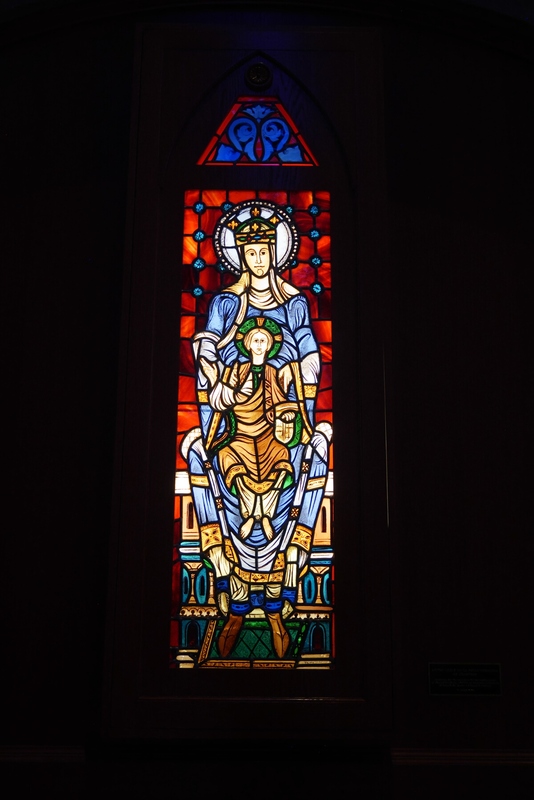 Copy of a window from Chartres Cathedral. Some archaic musical notation mounted on the wall. 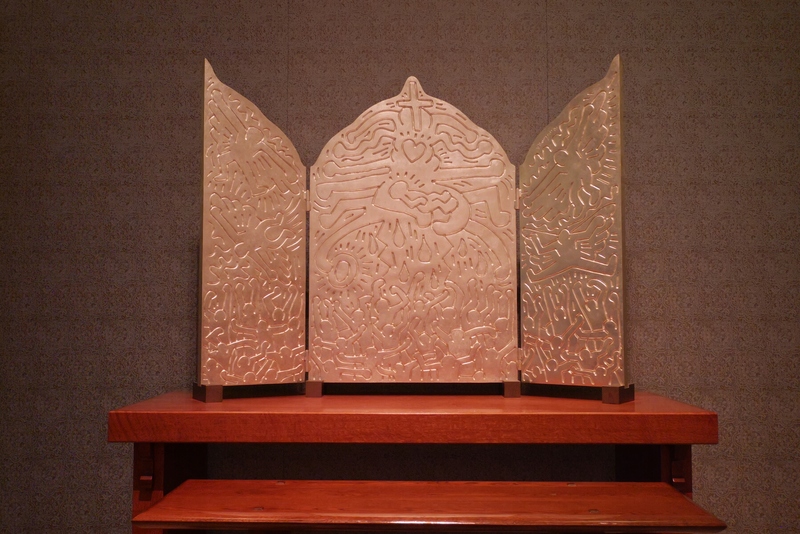 The Keith Haring triptych in the AIDS Memorial Chapel. 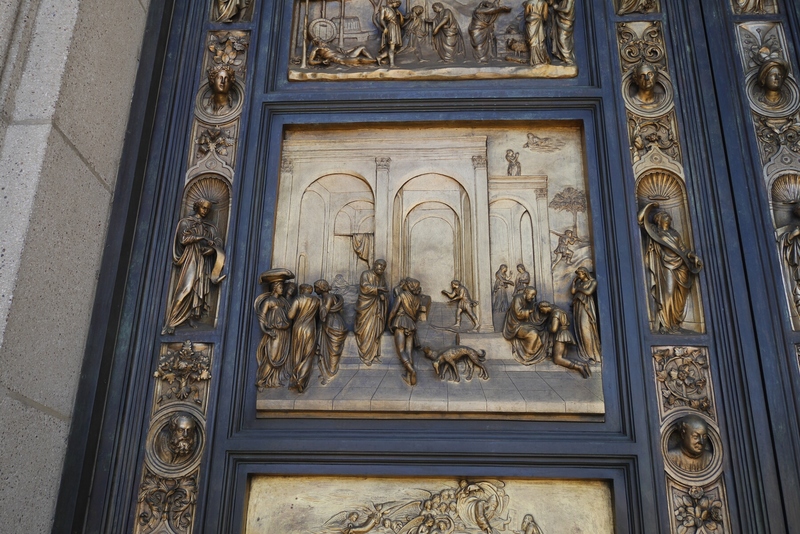 I was also surprised to discover that the cathedral has copies of the doors of the bapistry at the cathedral in Florence, a famous piece of art from the early Renaissance. 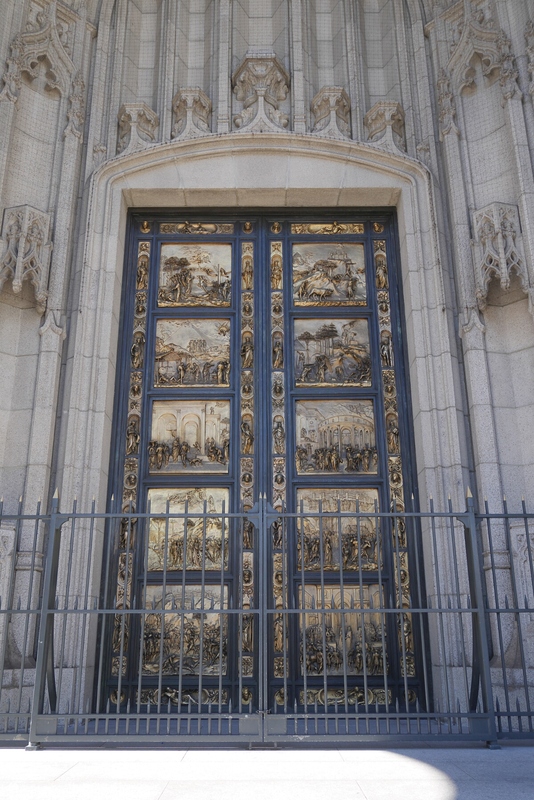 The doors in San Francisco were made from casts of the originals taken during World War II. Detail of the Jacob and Esau scene from the Ghiberti Doors. The next stop on my tour was the campus of the University of San Francisco, a Jesuit institution on the western side of the city near Golden Gate Park. 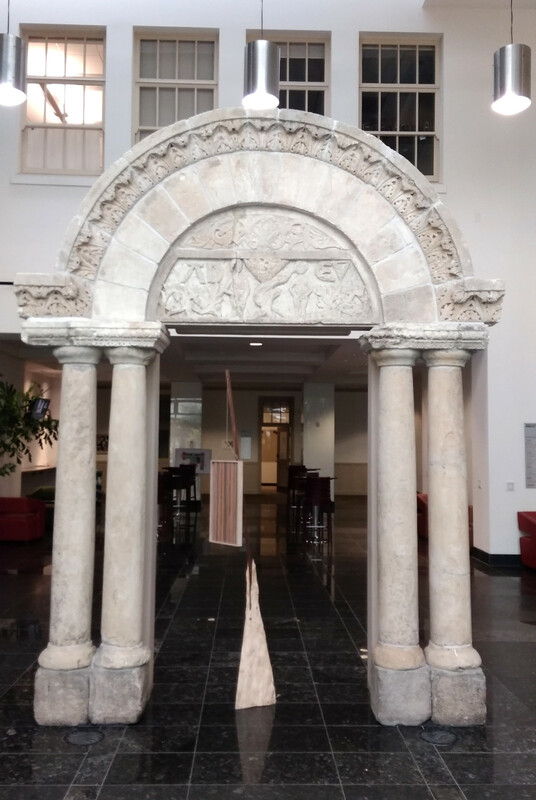 An outdoor theater in the back of Kalmanovitz Hall has a portal from Santa María de Óvila, a Cistercian monastery built in Spain between the twelfth and sixteenth centuries. By the twentieth century, the monastery had fallen into disuse, and in the 1930s, newspaper tycoon William Randolph Hearst bought large parts of it and had the stones crated and shipped to San Francisco. Although he planned to rebuild the monastery on one of his estates, that never happened, and the disassembled stones spent decades in Golden Gate Park. 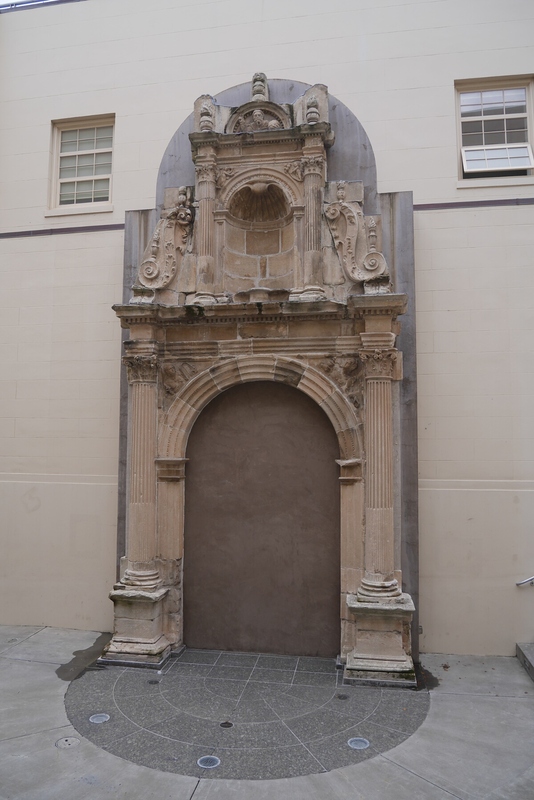 The de Young Museum assembled just the monastery’s church portal in 1965, but this was transferred to USF after the museum opened a new, earthquake-safe facility. Portal of Santa María de Óvila. 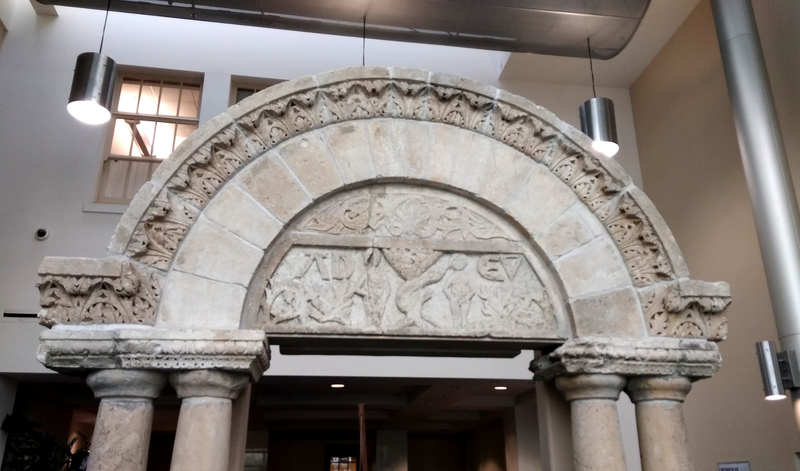 As a bonus, right inside Kalmanovitz Hall is another bit of medieval architecture, identified by a plaque on the wall as a “twelfth century Italian Romanesque portal.” It was gifted to USF by the Fine Arts Museums of San Francisco (the Legion of Honor and the de Young Museum). Detail of the top of the portal. 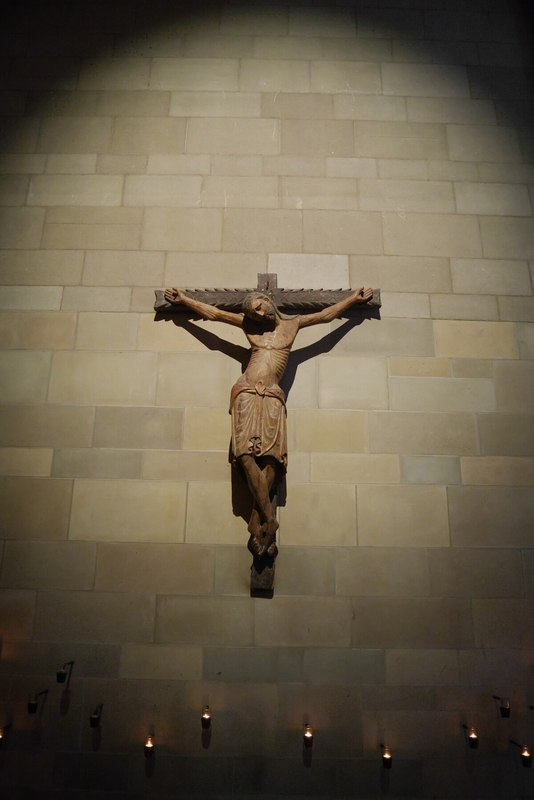 By the way, the rest of the stones for Hearst’s monastery were eventually transferred to New Clairvaux, a working Cistercian monastery in the Sacramento Valley. The stones were made into a new chapter house, which opened in 2012. 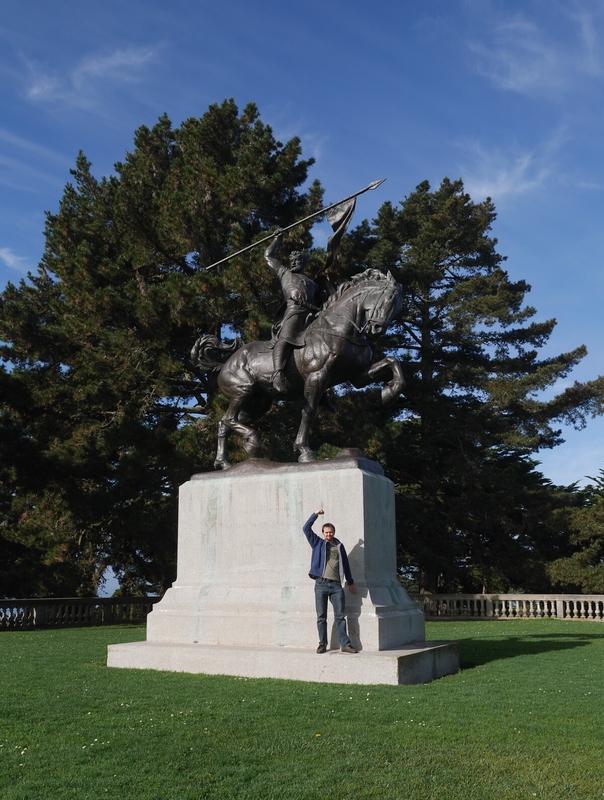 The last stop on my medieval San Francisco tour was the Legion of Honor, an art museum on a hilltop overlooking the Golden Gate and the city. In front of the museum are two modern statues of medieval warriors: Rodrigo Díaz and Jeanne d’Arc. I was especially interested in the statue of Rodrigo Díaz a.k.a. El Cid, an eleventh-century soldier of fortune who was exiled from his native Castile and set up an independent principality in Valencia. In the first medieval history class I taught, I had my students read The Song of the Cid, a twelfth-century fictionalization El Cid’s life and career. Your blogger with El Cid and Babieca. 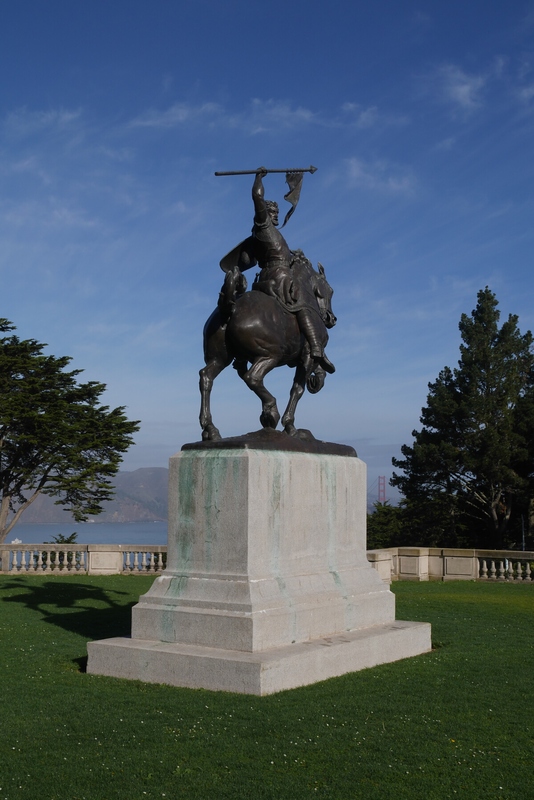 The Legion of Honor’s statue of El Cid astride his horse Babieca was sculpted by Anna Hyatt Huntington in 1921. This cast was made about six years later. Every vein on Babieca’s huge bronze body is bulging. Anna’s husband Archer had translated The Song of the Cid into English, and this sculpture seems to be based on the fictionalized character in the epic. 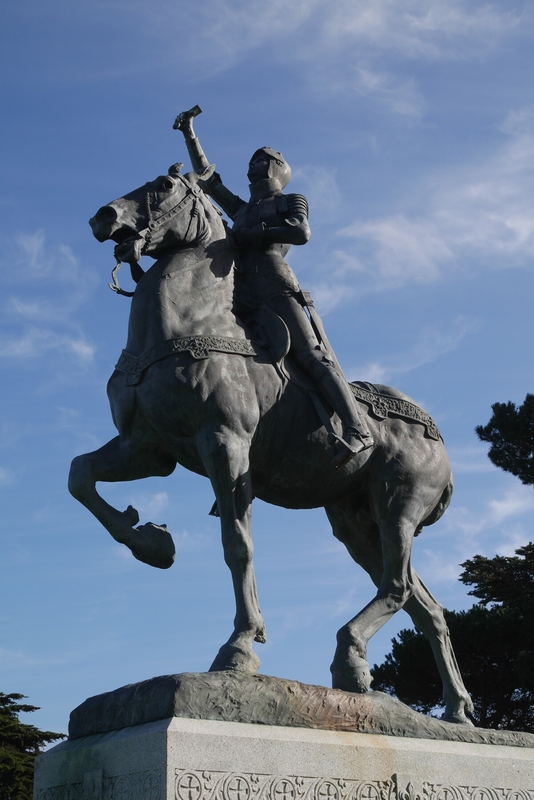 El Cid could see the Golden Gate Bridge if he would just turn his head. The other statue, also by Anna Hyatt Huntington, is Jeanne d’Arc, better known in English as Joan of Arc, the French peasant who led her people to some morale-boosting victories against the English in the Hundred Years’ War. I’d had my students read Joan’s threatening letter to the English, and I had just watched the Luc Besson film The Messenger (1999), so Joan was on my mind too. Joan of Arc is going to have trouble fighting the English without the blade of her sword. Just saying. 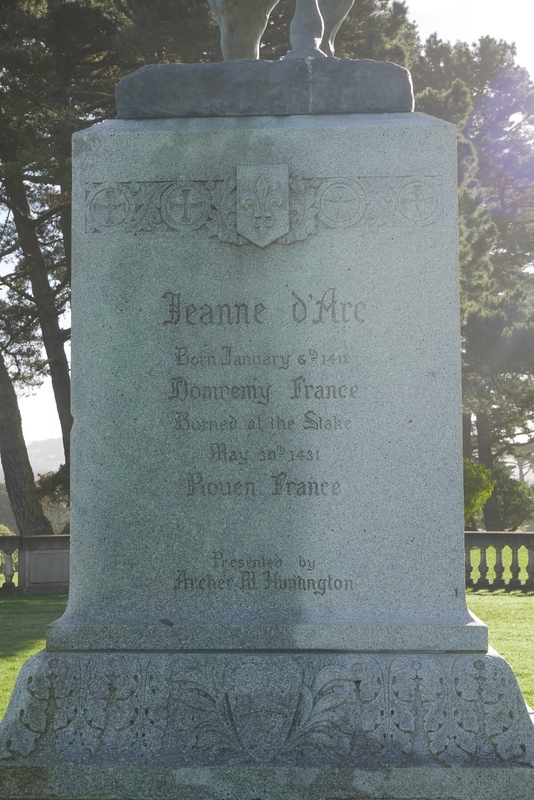 Pedestal of the Joan of Arc statue. 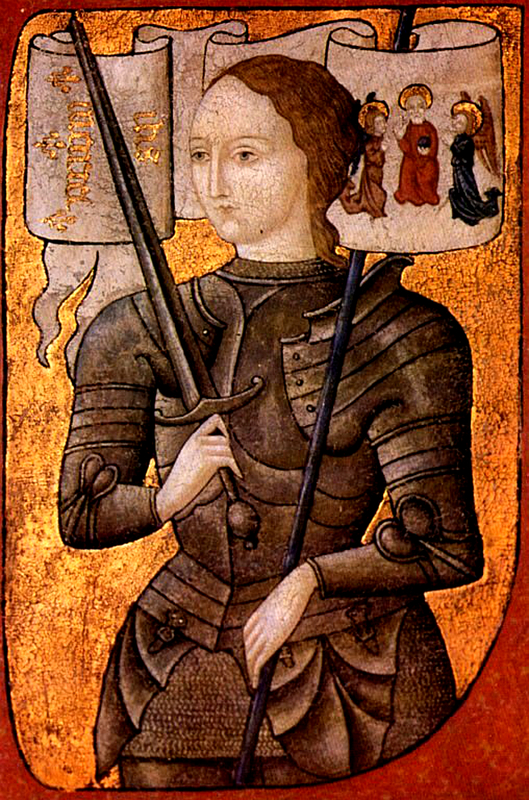 The design of Joan’s armor seems to be based on a fifteenth-century miniature painting of her. Late medieval miniature of Joan of Arc in armor. Inside the Legion of Honor museum, there is a gallery of actual medieval artifacts. 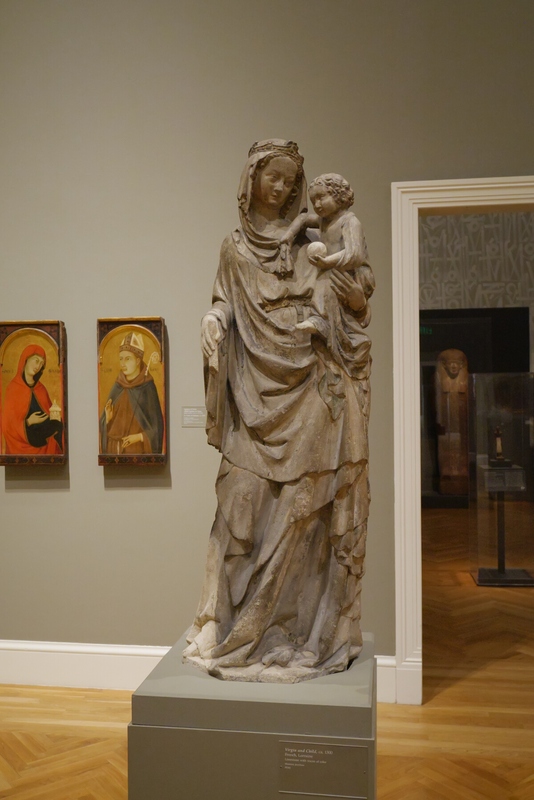 This Madonna with child is from thirteenth-century Lorraine. 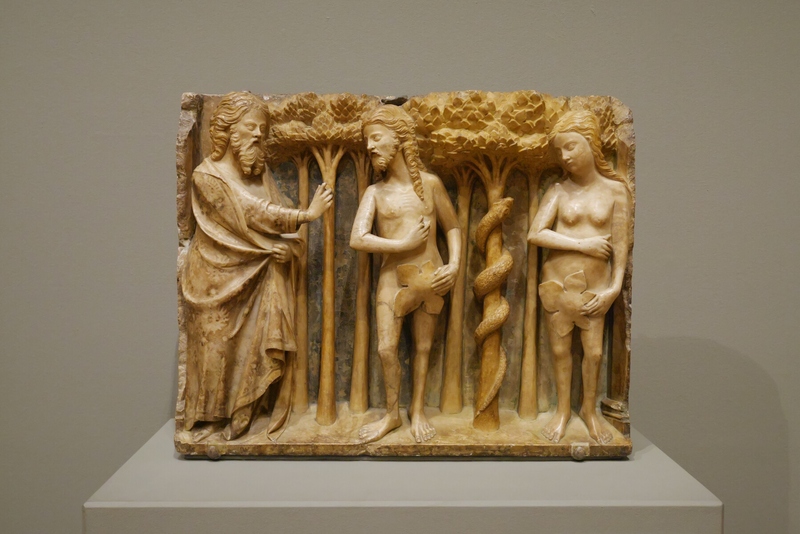 Adam and Eve being confronted by God from fourteenth-century Spain. 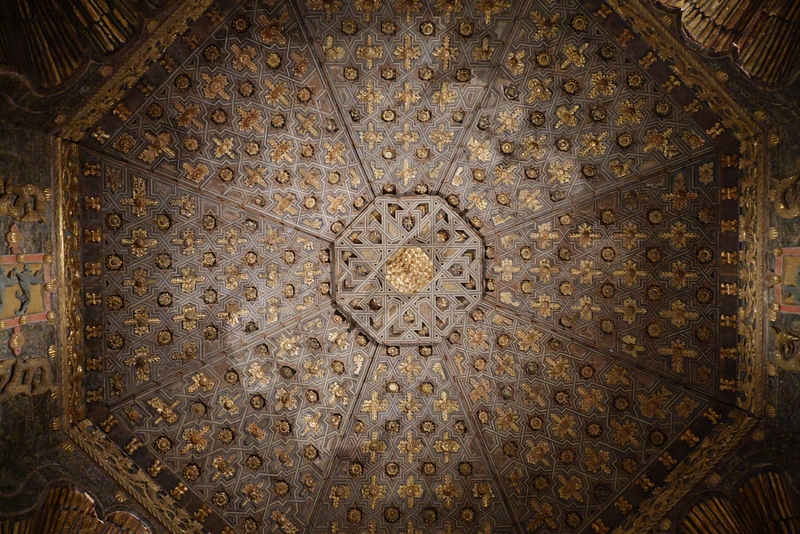 Ceiling from the Palacio de Altamira, fifteenth-century Spain. This remarkable piece of architecture shows clear Moorish influence. Thus ended my tour of medieval San Francisco. As it turns out, San Francisco does have something to tell me about the Middle Ages in Europe. 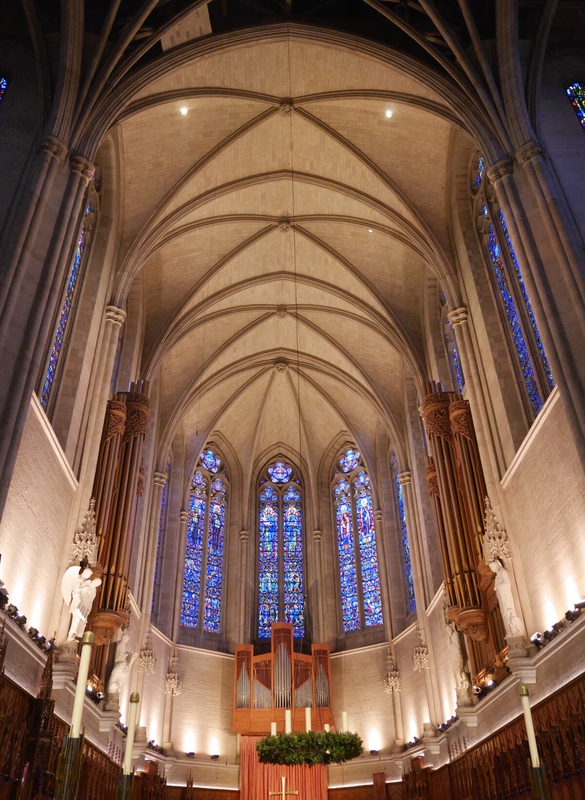 Despite being a modern building, Grace Cathedral got me thinking about what it might have felt like to visit one of the great cathedrals during the High Middle Ages. 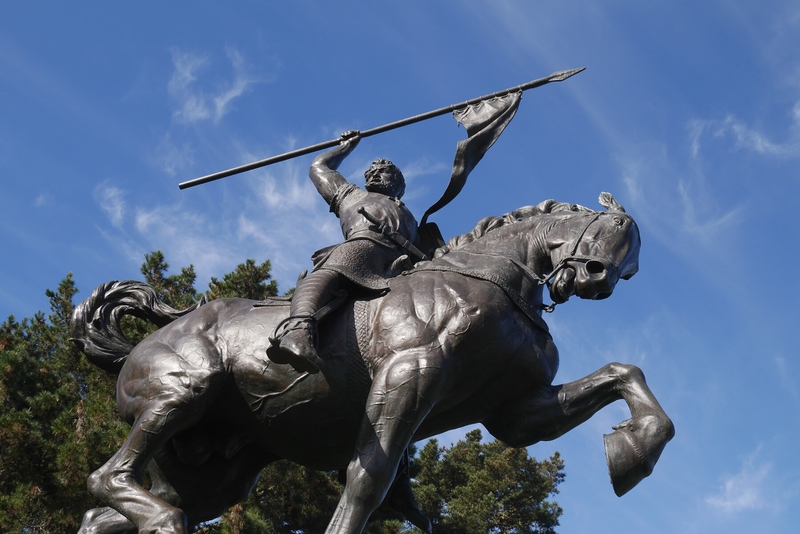 Anna Hyatt Huntington’s statues of El Cid and Joan of Arc made me consider how we remember and make use of the medieval past. And at USF and the Legion of Honor, I got to see actual relics of the Middle Ages in Europe. These places made me think about the Middle Ages in different ways than I could have by just looking at books. They could inspire my students to think differently as well. 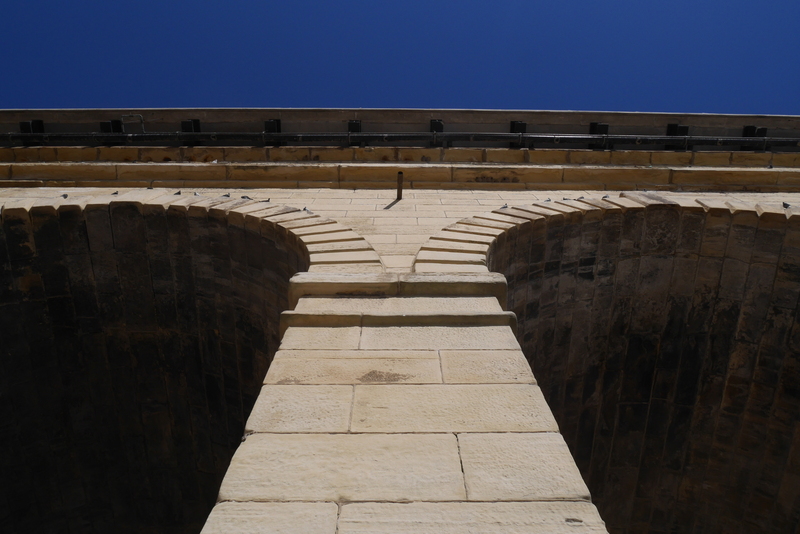 Last month, I was fortunate to have the opportunity to visit the remarkable Eads Bridge over the Mississippi River in St. Louis. I was in the city for a history of technology conference (SHOT 2018), and I used some free time before the conference to walk over the bridge. 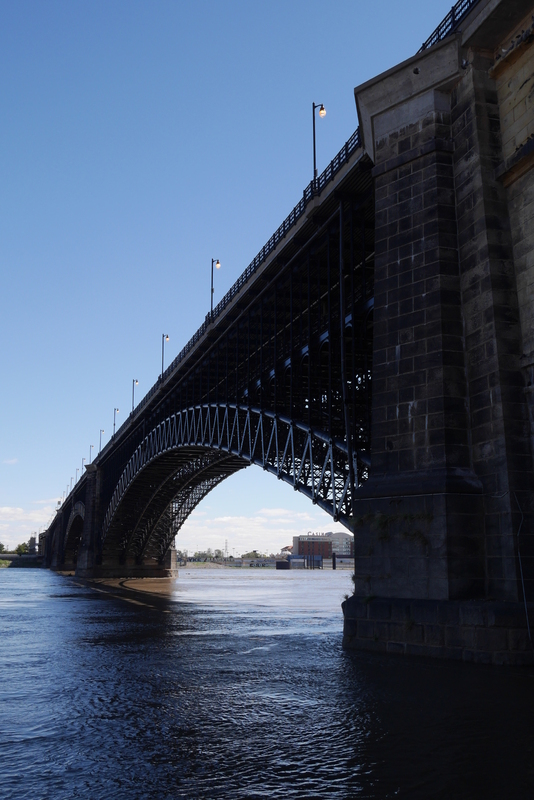 Eads Bridge is named after its designer and builder, James Buchanan Eads. 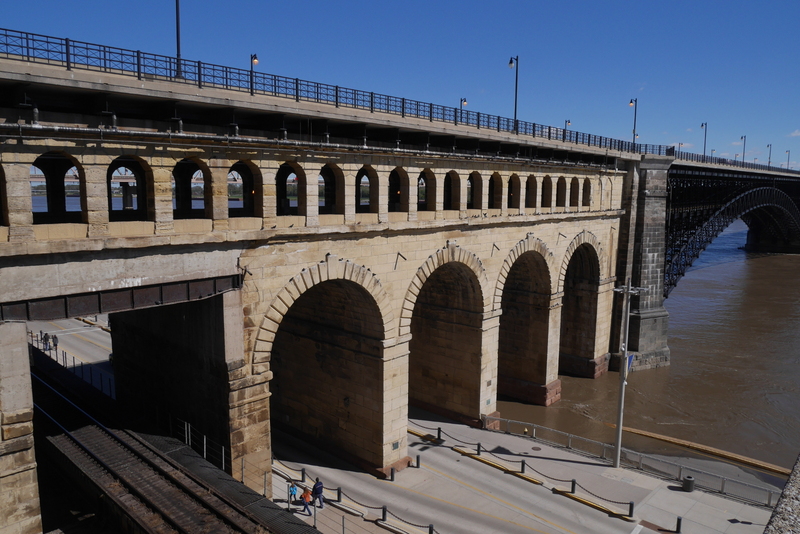 Built between 1869 and 1874, it consists of three steel arch spans and approach works on both the Missouri and Illinois sides (although the current approach works in Illinois are obviously newer than the rest of the bridge). 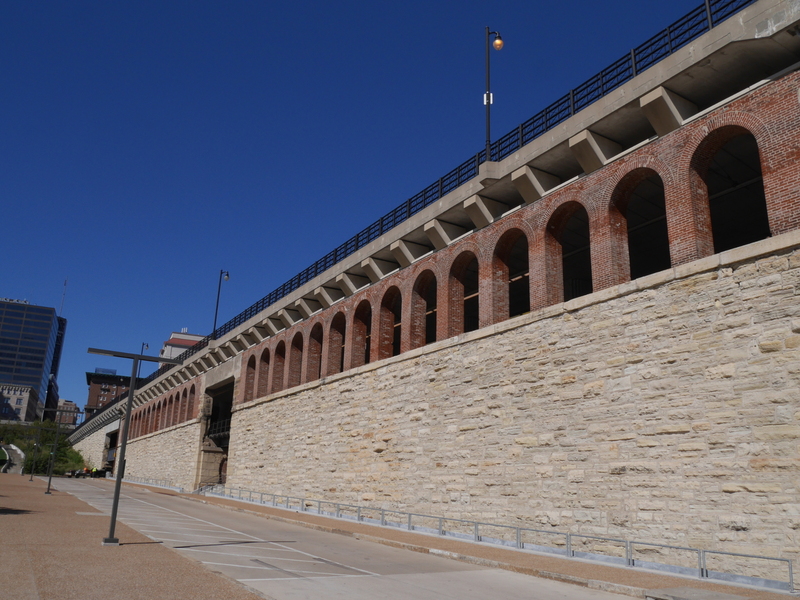 What makes Eads Bridge remarkable is that it was the first to use steel arches on a large scale. With its steel arches and stone abutments, it is also an attractive structure. Here are a few pictures from my visit in October. 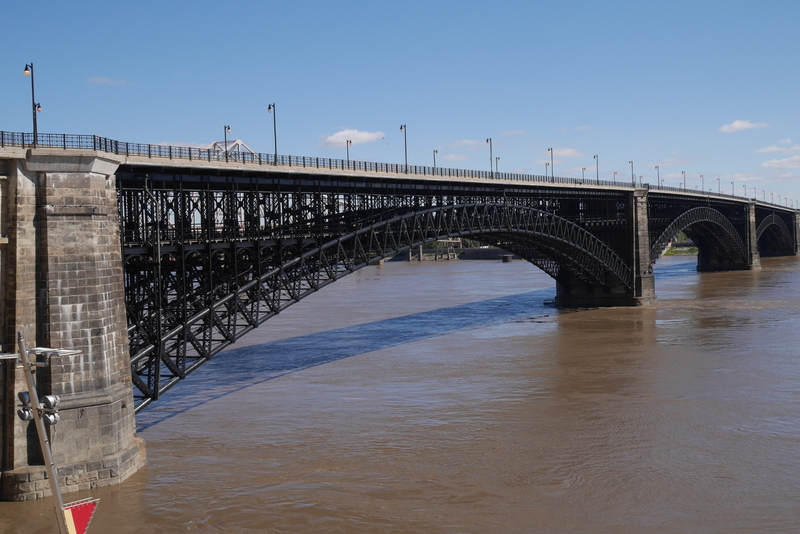 The three steel arch spans of Eads Bridge. A pillar between two of the stone arches. The imposing stone approach works on the Missouri side of the bridge. The upper deck of the bridge carries vehicles and pedestrian traffic, and the lower deck has tracks for the Metrolink streetcar system. 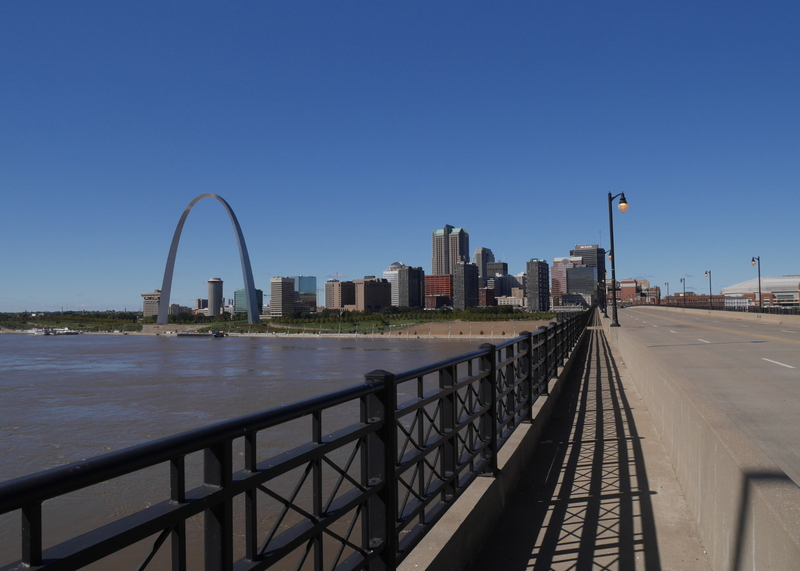 View from the eastern end of the bridge back toward downtown St. Louis. The upstream side of the bridge.